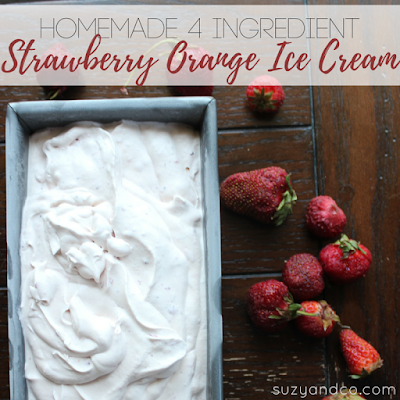 This homemade ice cream only has 4 ingredients. It is really simple to make and tastes so creamy and decadent. I am not going to try to convince anyone that this is healthy, even though this is a nutrition site. It is definitely still a treat not to be eaten in copious amount daily, no matter how much you really want to eat the whole thing. But at least the shorter ingredients list means you know what all the ingredients are. Put the 2 cups of cream in a mixer and blend on high until it turns into whip cream. Careful though, too much blending may turn it into butter! In a separate medium bowl add the sweetened condensed milk, strawberries and orange vitality oil and mix well. Pour into a container that holds ~5 cups. I used a loaf pan. *I only trust Young Living oils for ingestion. Not all oils, even the ones that say 100% pure, can be ingested. Unfortunately, there is no regulation on labeling of essential oils, so you really do not know what you are getting. With Young Living, you are only getting high quality oils without any fillers that are labeled for ingestion. This is not a marketing gimmick. Note: Technically this recipe has 5 ingredients. Why, because the sweetened condensed milk contains 2 ingredients itself. I am usually a stickler to counting up all the ingredients, including the ingredients in each ingredient, but I did not do it this time, I confess.